I actually got my act together this week and made something for dinner other than a grilled piece of meat and some veg (which is what we are having tonight for dinner, but whatever). I decided to go to my favorite source for all things paleo, Nonompaleo.com. One of my readers told me to try out the Asian Chicken Thighs, so that is exactly what I did. I will be honest - I am a chicken breast kind of girl. I don't mine picking apart a rotisserie chicken, but I am not partial to eating chicken meat off the bone. Now ribs, I can handle, but there is something about little tiny chicken bones in my mouth which kind of gives me the willies. But I have never been disappointed by a Nomnompaleo recipe, so I figured I would put my feelings about tiny bones in my mouth (insert male member joke here :) aside and start cooking. I won't do a step by step on here, as Michelle of Nomnompaleo has ridiculous detailed (and beautifully photographed) step by step instructions on her website, so click here for the full recipe. I will say that if you don't eat a paleo diet, you will find that you have to but a lot of ingredients that you don't normally have in your pantry (toasted sesame oil, fish sauce, rice wine vinegar, to name a few). Basically all you do is combine the ingredients in a food processer and pulse until they become a marinade. Put the chicken in a plastic bag, pour in the marinade, let it sit in the fridge for a few hours, and then cook. Very very simple. 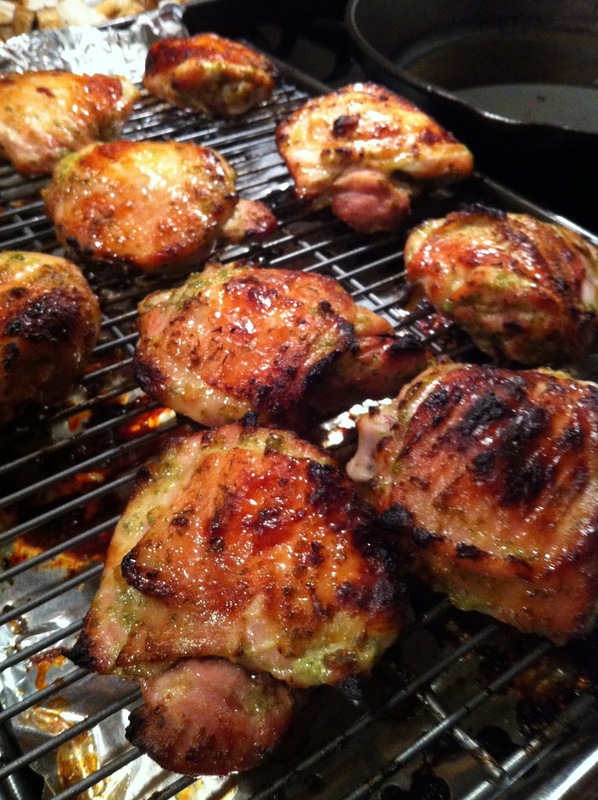 - I used only 3 pounds of thighs, and still felt like I didn't have enough marinade. Maybe when I marinate things I use more liquid than I need to though. - I cooked the chicken for 40 minutes at 400 degrees and still didn't have that crispy skin like Michelle says you get in the recipe. I left it in there for 3 more minutes and a few got a little crispy, but I was looking for that fabulous crispy chicken skin you get on whole chickens. It is probably something to do with my oven though, which is fairly old and cooks thing pretty unevenly. - The thighs are not as good the next day. As Michelle says in the recipe "eat immediately." - There is definitely enough for 4-6 people in this recipe so if you are making it for only 2, I would half the amount of chicken, but use the same amount of marinade. As I said, the leftovers were good, but not great. Overall I recommend giving this a try. I think it would be am amazing dish for a party, as they are really easy to eat with your hands (and not as messy as Michelle leads you to believe in the recipe). So glad you liked it! The last time I made them, I moved the oven rack up one slot, and that really helped the browning. I've also done the last few minutes on broil. When I reheat them, I usually do so under the broiler. They're definitely better freshly made, but I don't mind the reheated ones.